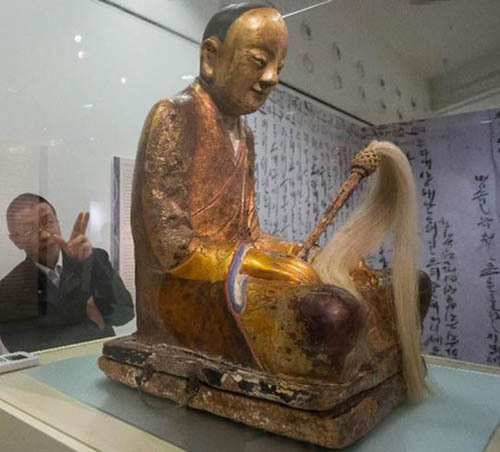 A statue of a sitting Buddha that made its way from a temple in China to a market in the Netherlands revealed an extraordinary secret -- a 1,000-year-old mummified monk. The mummy was discovered inside of a cavity inside the statue after a private buyer took it to an expert for restoration, according to CNN. It's not clear when the statue was taken out of China. 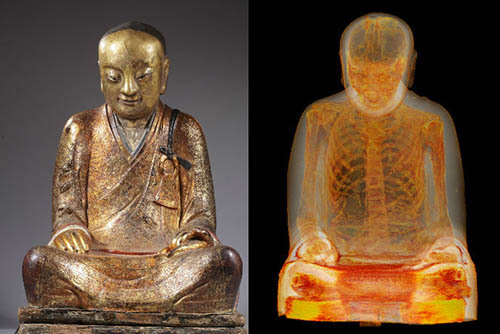 A team of researchers and scientists did a CT scan on the statue and found the mummy. They noted that the mummy's organs had gone missing. Researchers also found that the mummy was found sitting on a bundle to cloth that was covered in Chinese writing. They found out that the mummy's name was a Buddhist monk named Liuquan. But how he turned into a mummy is somewhat of a mystery. He may have went through the practice of self-mummification in Japan, China and Thailand from over 1,000 years ago. And the remains may have deteriorated and may have later been placed inside a statue. Some of the more infamous mummies to be discovered in China are those termed Tarim mummies because of their discovery in the Tarim basin. The dry desert climate of the basin proved to be an excellent agent for desiccation. For this reason, over 200 Tarim mummies, which are over 4,000 years old, were excavated from a cemetery in the present-day Xinjiang region. The decedents were found buried in upside-down boats with hundreds of 13-foot long wooden poles in the place of tombstones. 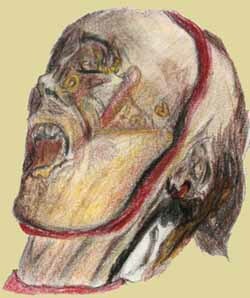 However, the most unique, and controversial, aspect of the Tarim mummies is their genetic heritage. Recent DNA sequencing data has proven that the mummies are of western descent, as opposed to the original eastern descent claimed by Chinese authorities. This has created a stir in the Turkic-speaking Uighur population of the region, who claim the area has always belonged to their culture, while the Chinese firmly state the area has always been a territory of China. The Tarim mummies are a series of mummies discovered in the Tarim Basin in present-day Xinjiang, China, which date from 1800 BC to AD 200. The most remarkable features of these mummies, given the general location of these graves, are the Caucasoid physical type feature the corpses exhibit. The mummies, particularly the early ones, are associated with the presence of the Indo-European Tocharian languages in the Tarim Basin. The cemetery at Yanbulaq contained 29 mummies which date from 1800-500 BC, 21 of which are Caucasoid - the earliest Caucasoid mummies found in the Tarim Basin - and eight of which are of the same Caucasoid physical type found at Qawrighul. However, more recent genetic studies painted a more complex picture (Xie et al., 2007). It showed both European and East Asian characteristics. "The Beauty of Loulan" is the oldest mummies found in the Tarim Basin come from Loulan located at the east end of the egg shaped Takla Makan Desert. Dressed only in shades of brown, she was alive as early as 2000 B.C. during the era of Abraham and the patriarchs. This woman was named the Loulan Beauty because of her pretty face and hair. The cemetery at Yanbulaq contained 29 mummies which date from 1100-500 BC, 21 of which are Caucasoid - the earliest Caucasoid mummies found in the Tarim basin - and 8 of which are of the same Caucasoid physical type found at Qawrighul. China -- An exhibit on the first floor of the museum here gives the government's unambiguous take on the history of this border region: "Xinjiang has been an inalienable part of the territory of China," says one prominent sign. But walk upstairs to the second floor, and the ancient corpses on display seem to tell a different story. One called the Loulan Beauty lies on her back with her shoulder-length hair matted down, her lips pursed in death, her high cheekbones and long nose the most obvious signs that she is not what one thinks of as Chinese. 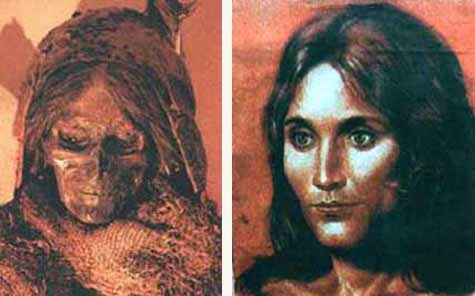 The Loulan Beauty is one of more than 200 remarkably well-preserved mummies discovered in the western deserts here over the last few decades. The ancient bodies have become protagonists in a very contemporary political dispute over who should control the Xinjiang Uighur Autonomous Region. The Chinese authorities here face an intermittent separatist movement of nationalist Uighurs, a Turkic-speaking Muslim people who number nine million in Xinjiang. At the heart of the matter lie these questions: Who first settled this inhospitable part of western China? And for how long has the oil-rich region been part of the Chinese empire? Uighur nationalists have gleaned evidence from the mummies, whose corpses span thousands of years, to support historical claims to the region. Foreign scholars say that at the very least, the Tarim mummies - named after the vast Tarim Basin where they were found - show that Xinjiang has always been a melting pot, a place where people from various corners of Eurasia founded societies and where cultures overlapped. Contact between peoples was particularly frequent in the heyday of the Silk Road, when camel caravans transported goods that flowed from as far away as the Mediterranean. "It's historically been a place where cultures have mixed together," said Yidilisi Abuduresula, 58, a Uighur archaeologist in Xinjiang working on the mummies. The Tarim mummies seem to indicate that the very first people to settle the area came from the west - down from the steppes of Central Asia and even farther afield - and not from the fertile plains and river valleys of the Chinese interior. The oldest, like the Loulan Beauty, date back 3,800 years. Mummies known as 'Cherchen Man and Family' (three women and a baby) who were members of the ancient Caledonii tribe of central Scotland, have been unearthed in a burial site thousands of miles east of where the Celts established their biggest European settlements in France and the British Isles. They were found in the Taklamakan desert in the western Chinese region of Xinjiang in whose language the word "Taklamakan" means "you go in and never come out". The mummies are currently housed in glass display cases in a new museum in the provincial capital of Urumqi. The male mummy had hair of reddish brown, high cheekbones, a long nose, full lips and a ginger beard; hardly Oriental in any way. He stood six feet tall and was buried wearing a red twill tunic and tartan leggings. Even his DNA indicates that he was indeed Celtic in origin. Cherchen Man was around fifty years old and 6 feet 6 inches tall and had his long braided hair. He had ten hats with him. One hat looks Roman, another like a Merlin the Magician conical hat, a Robin Hood cap, and a beret. He wore purply-red-brown, two piece suit that covers most of his body. He had a red strand of wool looped through both of his ear lobes. Originally the man wore soft white deerskin boots to above his knees--the left one is still there, but the right one has been torn away; revealing a horizontal striped tattoo in colors of red, yellow, and blue. The first thing you notice about Cherchen Woman is that her chin strap failed to hold her jaw shut. When a mummy's mouth is open like this it is called a mummy gape. She and the others were all painted with a yellow substances that is believed to help preserve them. Like the Cherchen Man, she has multiple tattoos on her face, and red yarn through her ear lobes. She is over six foot tall, has braided hair and took lots of clothes with her to the grave. She and the other mummies that were found with her are on display at the Museum in Urumchi where she is displayed in her long red dress and deerskin boots. 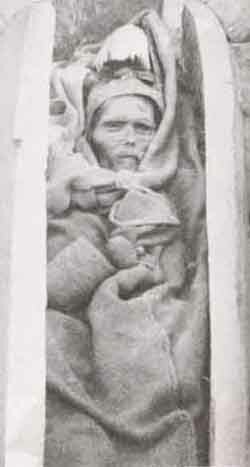 Another women sharing Cherchen Man's tomb had light brown hair, which appears to have been freshly brushed and braided. Her face is painted with curling designs, and her striking red burial gown is still lustrous even after three thousand years under the sand of the Northern Silk Road. The bodies are far better preserved than Egyptian mummies. 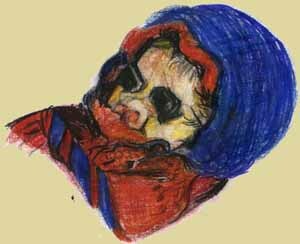 The mummy of this three month old baby found with them has little blue stones covering her eyes and tiny wisps of red wool in her nostrils. All bundled up with a blue hat, she had with her a cowhorn cup and a sheep udder nursing bottle. Clothing indicates they were all part of the same household buried approximately 1000 B.C. DNA sequence data shows that the mummies happened to have haplotype characteristic of western Eurasia in the area of south Russia. A team of Chinese and American researchers working in Sweden tested DNA from 52 separate mummies, including the mummy denoted "Beauty of Loulan." By genetically mapping the mummies' origins, the researchers confirmed the theory that these mummies were of West Eurasian descent. The textiles found with the mummies are of an early European textile and weave type and are similar to textiles found on the bodies of salt miners in Austria of around 1300BC. Mair states that "the earliest mummies in the Tarim Basin were exclusively Caucausoid, or Europoid" with east Asian migrants arriving in the eastern portions of the Tarim Basin around 1800BC while the Uighur peoples arrived around the year 842. In trying to trace the origins of these populations, Victor Mair's team suggested that they may have arrived in the region by way of the forbidding Pamir Mountains about 5000 years ago. This evidence remains controversial. It refutes the contemporary nationalist claims of the present-day Uighur peoples who claim that they are the indigenous people of Xinjiang, rather than the Chinese Hans. In comparing the DNA of the mummies to that of modern day Uighur peoples, Mair's team found some genetic similarities with the mummies, but "no direct links". B. E. Hemphill's biodistance analysis of cranial metrics (as cited in Larsen 2002 and Schurr 2001) has questioned the identification of the Tarim Basin population as European, noting that the earlier population has close affinities to the Indus Valley population, and the later population with the Oxus River valley population. Because craniometry can produce results which make no sense at all (e.g. the close relationship between Neolithic populations in Russia and Portugal) and therefore lack any historical meaning, any putative genetic relationship must be consistent with geographical plausibility and have the support of other evidence. Hemphill & Mallory (2004) confirm a second Caucasoid physical type at Alwighul (700-1 BC) and Kroran (AD 200) different from the earlier one found at Qawrighul (1800 BC) and Yanbulaq (1100-500 BC). > The world's oldest cheese has been found on the necks and chests of perfectly preserved mummies buried in China's desert sand. Dating back as early as 1615 B.C., the lumps of yellowish organic material have provided direct evidence for the oldest known dairy fermentation method. The individuals were likely buried with the cheese so they could savor it in the afterlife. Although cheese-making is known from sites in northern Europe as early as the 6th millennium B.C. and was common in Egypt and Mesopotamia in 3rd millennium B.C., until now no remains of ancient cheeses had been found.